This bar’s interior is made entirely out of euro-pallets. The Stapelbar is located in the middle of Ehrenfeld’s Helios Quarter, a former industrial quarter which is now famous for its bars and clubs, and is my favourite bar in this area. The name is a German pun – it’s the translation of stackable (because euro-pallets) and also has the word bar in it. This is the best play on words in Cologne’s bar scene, and – believe me – there are plenty. What I like most about this place, is that it is not trying too hard, even though you might expect that from a place like this in an area like this. The service is exceptionally friendly (the bartenders are always up for a joke) and the atmosphere is laid back and chilled. They organize public screenings of the famous German crime series “Tatort” every Sunday. It also opens at 12:00 on the weekend and serves delicious cake. 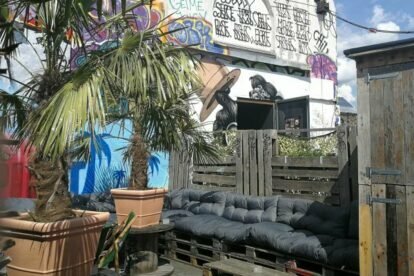 I like to come here for an after-work beer in the summer, especially as you can sit outside on the huge couches. Surrounded by palm trees, you get the feeling you’re on a little vacation. The view of Cologne’s Television Tower is also a nice gimmick.